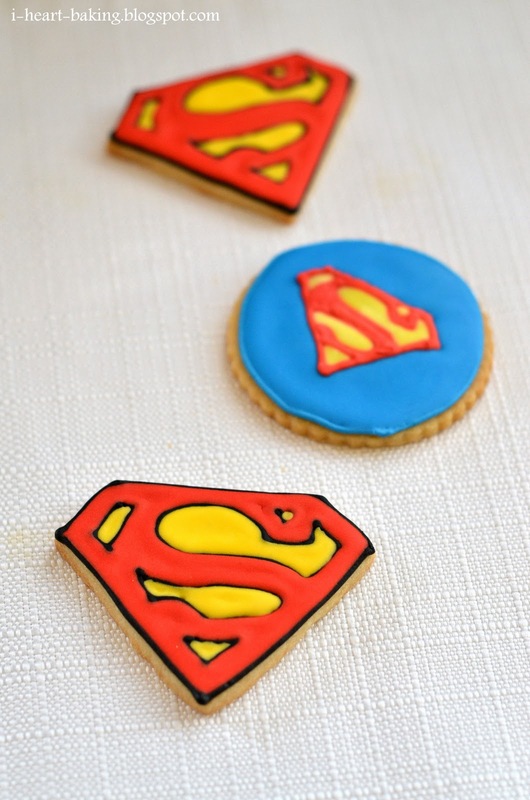 To go along with the Superman cake that I made for my son Matthew's 4th birthday, I made Superman cookies to include with the party favors. 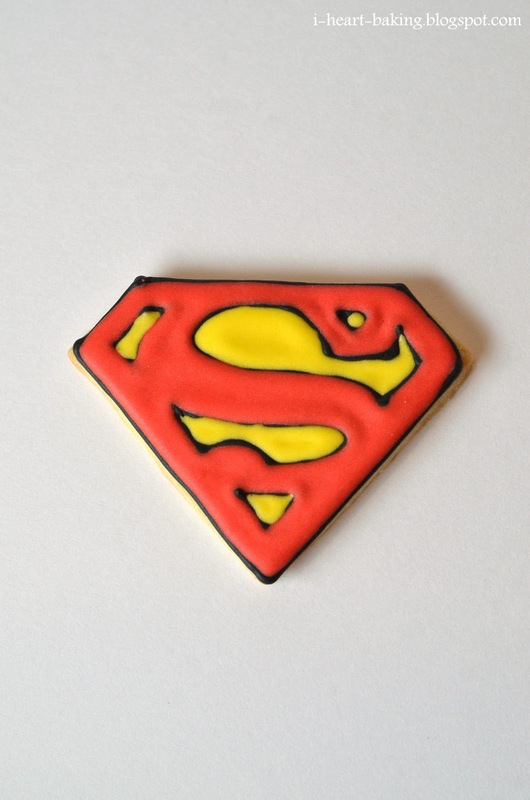 Originally I was going to just do letter cookies ("M" for Matthew) as well as a Superman logo piped onto a round cookie, but my husband offered to make me a custom Superman logo shaped cookie cutter, and of course I couldn't refuse! Once the cookie cutter was ready (it took him about 5 minutes to make this one! ), I made my favorite homemade sugar cookie recipe and cut out my Superman logo cookies. 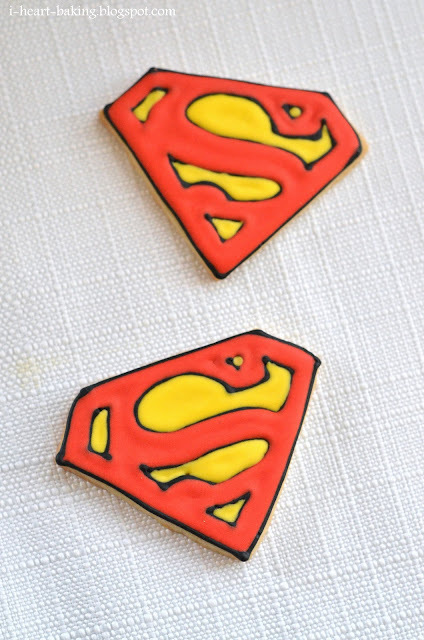 After the cookies had baked and cooled, I piped the Superman logo detail in black royal icing, and the filled it in with red and yellow royal icing. 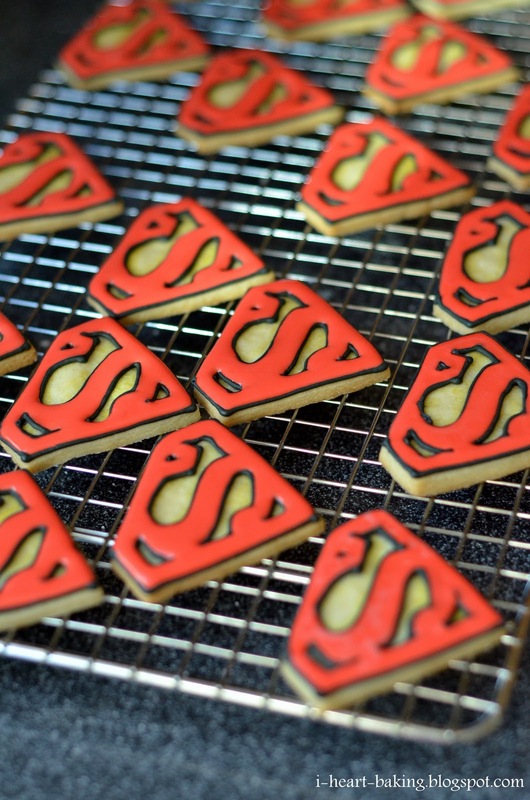 I also made the originally planned round cookies with the Superman logo piped on top, which was inspired by Matthew's favorite Superman t-shirt. Matthew loved the cookies, and I hope everyone else at the party did too! @Alida - thank you! :) and yes my son was very excited about the cookies! Great looking cookies! You are so lucky to have a husband that can make you cookie cutters!! Yay for hubby and your son is SO cute! Absolutely amazing!! I love them! I will have to see if the metals teacher at work will make me a cutter like that!!! Love them! @Lo-mo - thank you! oh thats a great idea, i'm sure the metals teached could easily make one for you!!! Simply amazing... I love these cookies. You are so talented, I can't believe the artistry of your creations. This blog is fantastic, I'm so glad I found it! How did you make the "S" so uniform across all the cookies? These are super-cute. (I didn't intend that weak pun there but there you go. )I've pinned this for later reference. I will definitely have to make these!